Hello and welcome to Mama Elephant’s #celebrating6years Anniversary Release Stampede with our wonderful crafty friends and designers! The wait is finally over! The release is now live and available for purchase in the shop! To celebrate with you, we have this amazing sale and promotion and giveaway! Keep reading to the end! Spend $100* — receive 1 free ‘Color Me Letters’ 4×6 stamp set. Spend $150* — receive 1 free ‘Color Me Letters’ 4×6 stamp set and ‘Hilly THANKS’ dies. 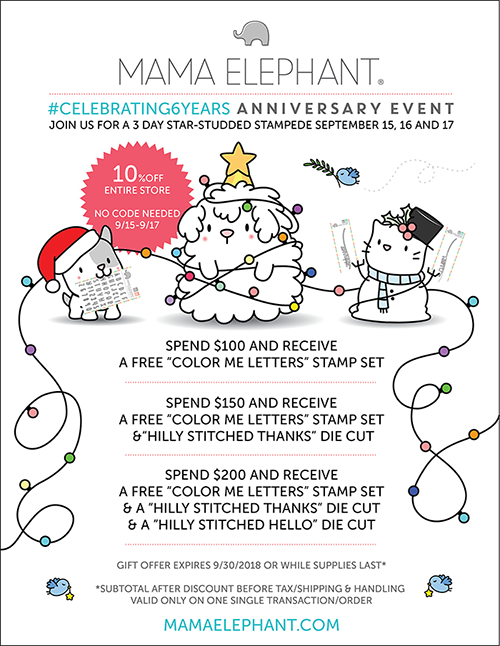 Spend $200* — receive 1 free ‘Color Me Letters’ 4×6 stamp set, ‘Hilly THANKS’ dies, and ‘Hilly HELLO’ dies. So excited to join Mama Elephant team again for this blog hop! ANd to play with so sweet stamps! It is not the season yet, but I always like to create winter and Christmas themed cards! I prepared two cards to share with you today, I hope, you will like them. I had such a great pleasure creating them. When I finished the coloring, I covered the image with the masking paper (I stamped the same image on this paper and fussy cut it). I then blended the entire background with blue, violet and black ink, applied a sun rays stencil over it with the white ink. At the end, I sprinkled it with the white paint using old tooth brush. For the sentiment, I white heat embossed the phrase from the same stamp set on the skinny black narrow. And as additional detail, I colored and die two individual kitties. They are foam mounted together with the sentiment strip. For my second card, I used Yappy Woofmas stamp set. It is so sweet!! I adore that kitty snowman! I stamped, colored with Copic markers and die cut with the matching dies some images. For the background, I dry embossed a piece of white card stock using the brick wall stencil and blended it with the dark red ink. I also added some elements from the old Mama Elephant sets. The door is from lat year’s Meowy Woofmas stamp set, and the sentiments are from labeled messages sets. I adhered the door to the wall, foam mounted the main characters, and the card is ready! Joining us on this wild ride of a stampede are our favorite crafty designer friends! Please visit them to see what they did with the new goodies! Make sure you come back tomorrow as another line up of designers are ready to rock the new release! Love your Kitty card…soooooo FUN! Oh Wow!!! These are super cute!!! I love what you did with the little kitty tree! I have already ordered it. Too cute to refuse! Thanks for the beautiful examples! I’m a cat lover, so I most definitely like the cat tree, and it has a wow factor because of the glowing background you applied with creative talent. these are all so sweet…such a fun way to celebrate! The blending around the kitty tree is great! I love the way it looks like the whole tree is radiating light. And the scene with the dogs clustered around the door is just so cute! Both cards are absolutely amazing, they are beautiful. Both are so cute. Love the brick background on the second one. Super cute cards! Love the kitty tree! Super cute cards. I love the white rays behind the Kitty Tree. Amazing card designs! You bring such depth and dimension in your coloring and elements. Love the brick wall! Your stenciling adds so much to these cards. What adorable scenes! These are both so adorable!!! Love your backgrounds! Oh my gosh, adorable cards! I love the bright colours! Two adorable cards! Such eye-catching color palettes! Fabulous cards! I adore the kitty tree stamp. I love how you colored the cats all differently. The puppies are so cute too. Oh so cute…I especially love your kitty tree! This is so brilliant with your coloring. Those dogs are my favorites, too!